Almost two years ago, we found out about the work of Justin and Rosemary Van Kleeck, who were building a new approach to farmed animal rescue and care. We were so impressed by their philosophy, and so determined to help them spread it to a bigger audience, we gave them a grant for animal activism through our partnership with the kind people at The Pollination Project. 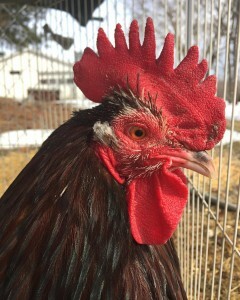 With this grant, the Van Kleecks were able to develop an excellent website as a resource for people everywhere engaged in this form of advocacy and animal care. At the online home of the Microsanctuary Movement, there are guides for taking caring of different species, a listing of trustworthy veterinarians that treat farmed animals, and advice on supporting and sustaining a microsanctuary. Now, there’s something more they’re offering individuals with personal or nonprofit microsanctuaries: cash money. Individuals can get a $500 grant, and nonprofits can get $1000. Grant recipients will also get consulting and guidance from other microsanctuary experts. Working with The Pollination Project, one of the things I learned about donating is the importance of timing. At the wrong time, a thousand dollars doesn’t help much. At the right time, it helps enormously, especially when it represents the difference between moving forward with a project – or not. TPP has multiple examples of how small grants given at the right time have helped their grantees gain even more financial support and validation for their grassroots activism. I’m going to brag that this is true of The Microsanctuary Movement too. That initial grant helped put a web infrastructure in place, and helped create a centralized hub for people engaged in this form of animal rescue and advocacy. Now, with this new donation funding these seed grants, Microsanctuary Movement is ‘paying it forward’ to other individuals and nonprofit microsanctuaries. And with these microsanctuary micro-grants, perhaps the next wave of vegans caring for farmed animals in their own homes can also attract more support for the life-saving work they’re doing. To apply for a seed grant for your farmed animal rescue and care efforts, go here. 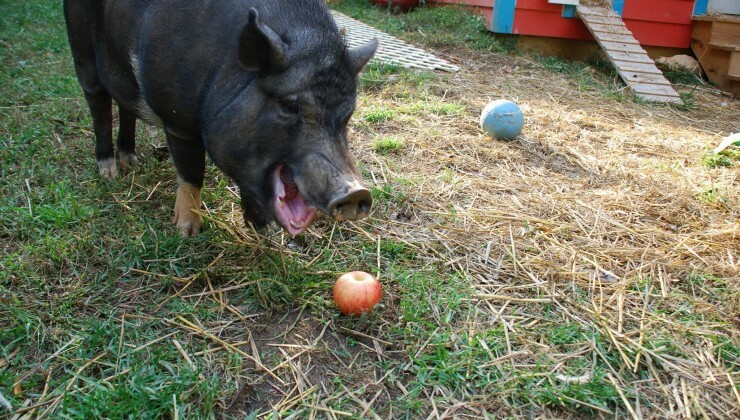 Featured image: Mott, who enjoys apples, is a resident of Triangle Chance for All in NC, where the Microsanctuary Movement began (http://trianglechanceforall.org). What a fantastic idea! I can see how these grants would be hugely helpful for anyone running a small sanctuary.